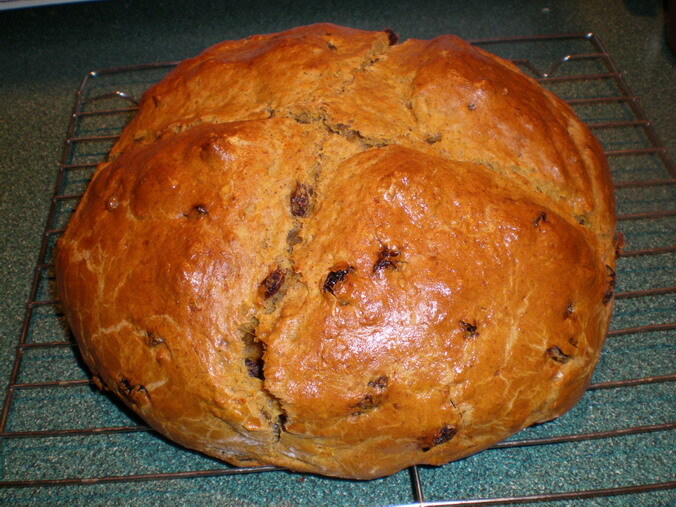 Glorious Golden Irish Sweet Potato Bread!! I am proud to say this is my very own creation! It’s fantastic; tastes like a sweet bread with the spices and you almost think you’re eating a pumpkin bread, but there’s NO sugar!! You’ll love it just buttered as a snack. 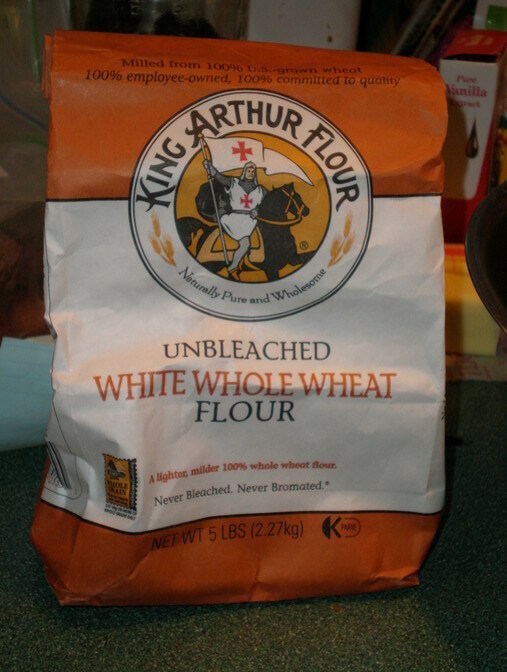 Use half regular white flour and half white whole wheat flour. 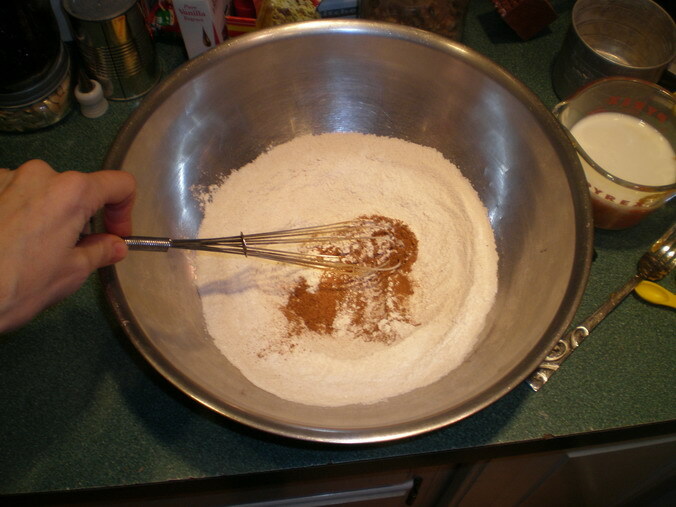 Sift dry ingredients into a big bowl or just put in bowl and mix very well with a whisk to combine. 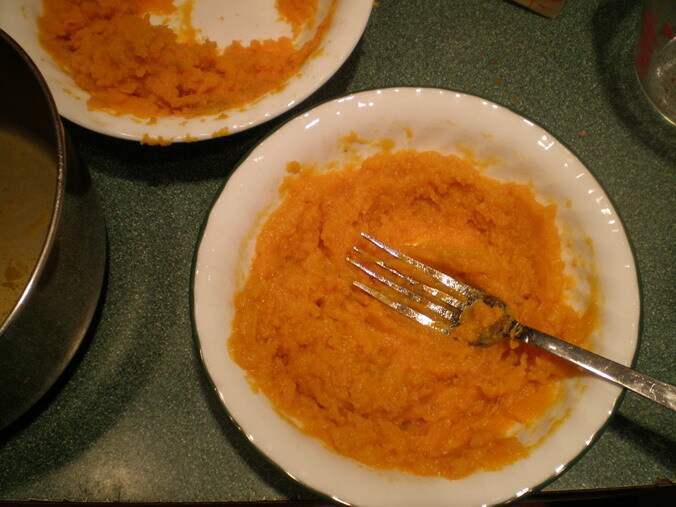 Mash with some of the water when done to look like canned pumpkin consistency, not too watery. 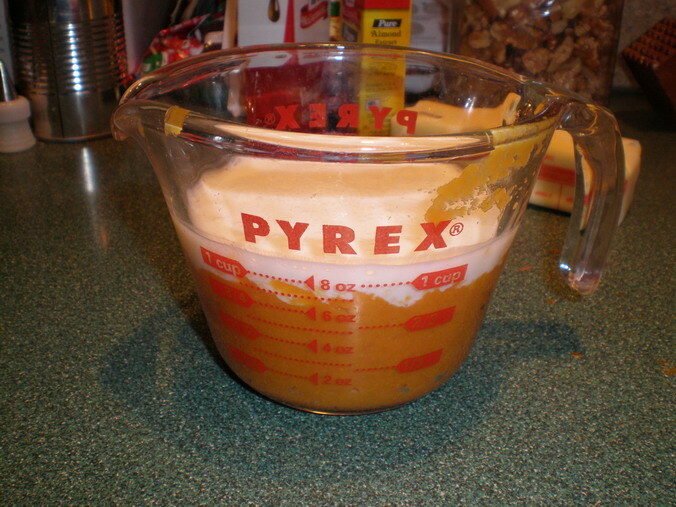 Measure out 1/2 c + 1/3 c and put into a glass measuring cup then add buttermilk up to 1c. 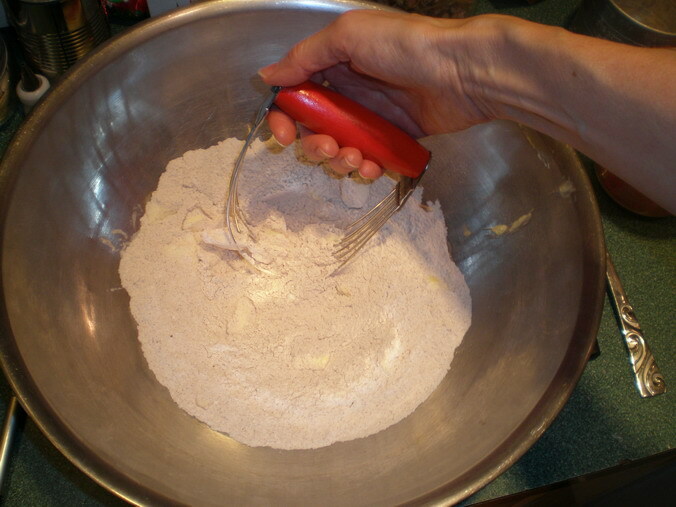 Cut butter into little chunks over the flour mixture, then cut in with a pastry blender a bit. Then use your finger tips to squish the butter bits, keep working with fingers until it’s all just crumbly. 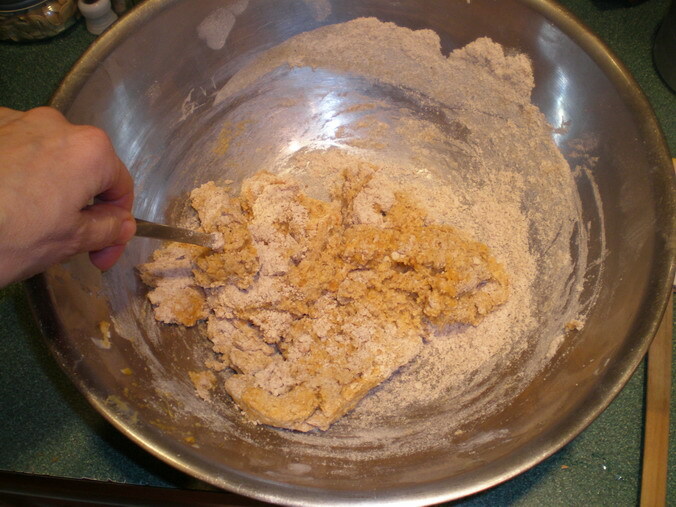 Add egg and potato mixture into flour and mix. 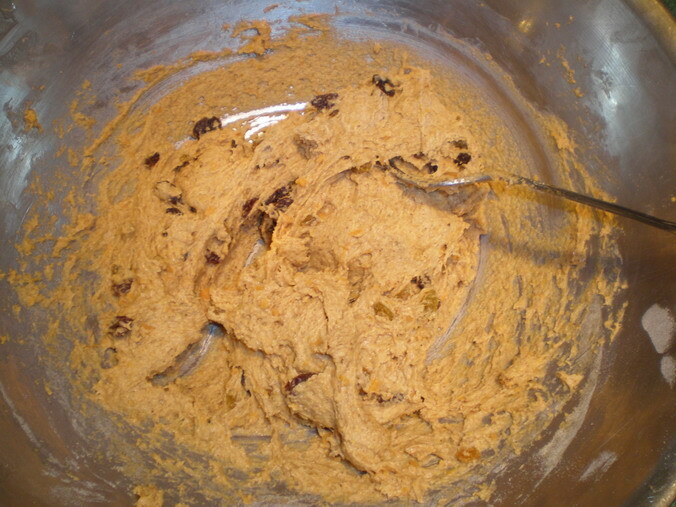 Add raisins and stir dough vigorously. 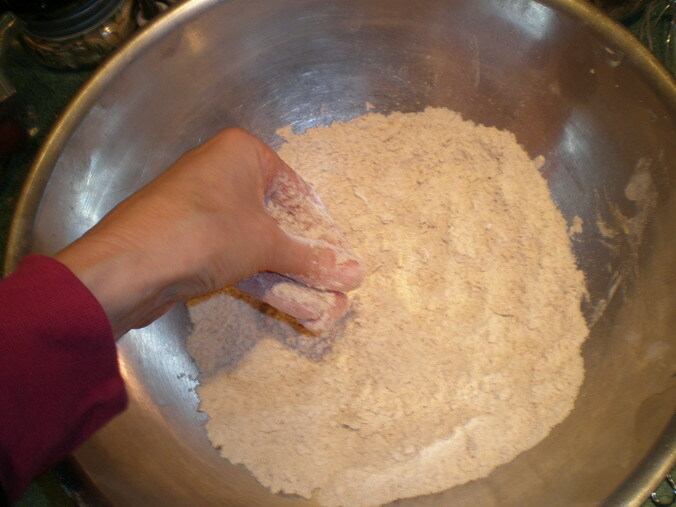 You can knead the dough right in the mixing bowl, dust the dough with flour and use a rubber spatula or what I prefer a ‘bowl scraper’ to fold dough over and incorporate flour. 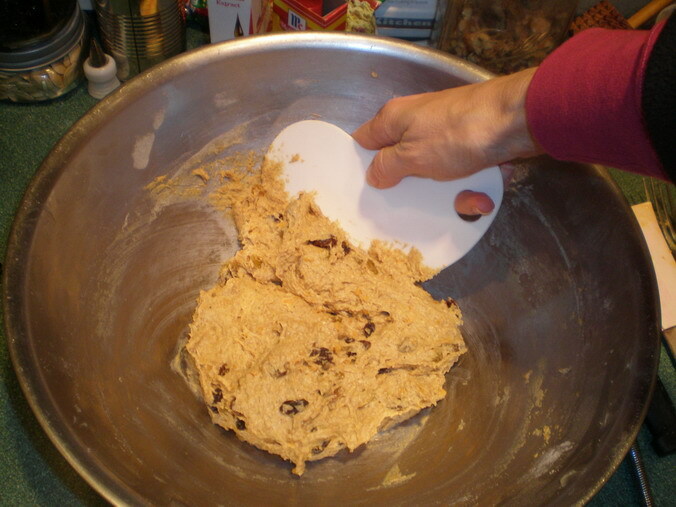 Add more as needed until dough is not quite as sticky. 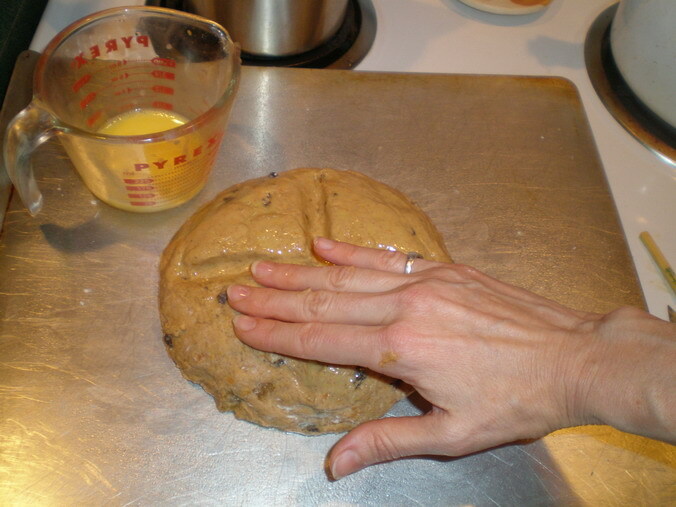 Grease cookie sheet and gently plop dough on it, make it into a neat, rounded ball. Cut a cross into top with a sharp little knife. Pat top with one beaten egg using fingers (I find this is just quicker and easier!) or a pastry brush, get it into the cross too. 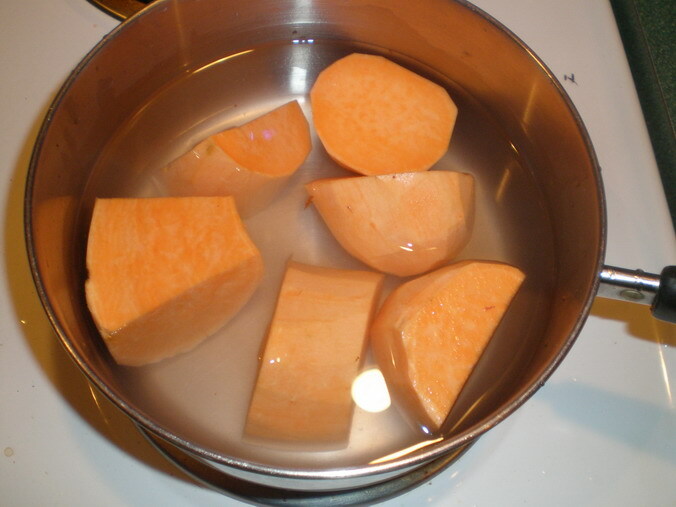 * For regular potato bread you can use regular potato and leave out the spices. * If you don’t have store bought buttermilk you can make up your own, I almost always have to. 1c milk plus 1 Tablespoon of vinegar or lemon juice is the ratio, for this recipe just mix 1/3 c milk with 1 tsp vinegar or lemon juice, it should be enough, make more if needed. 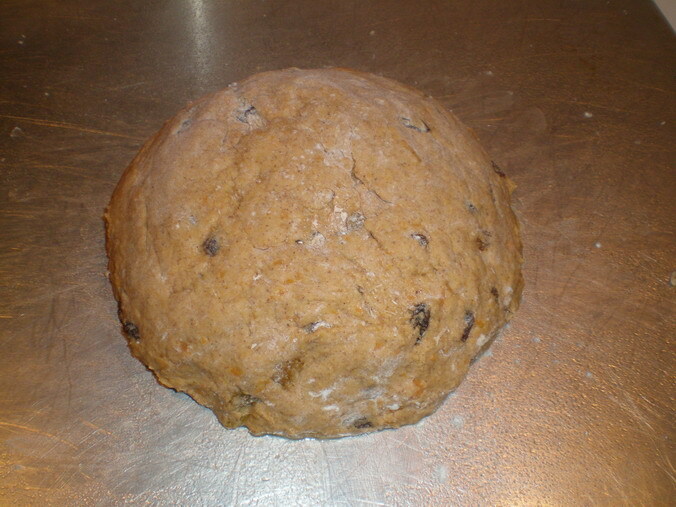 *This bread tastes like a dessert bread or pumpkin bread but has no sugar and uses very healthy sweet potato which is especially good for women! Great taste! This is a really nice recipe. 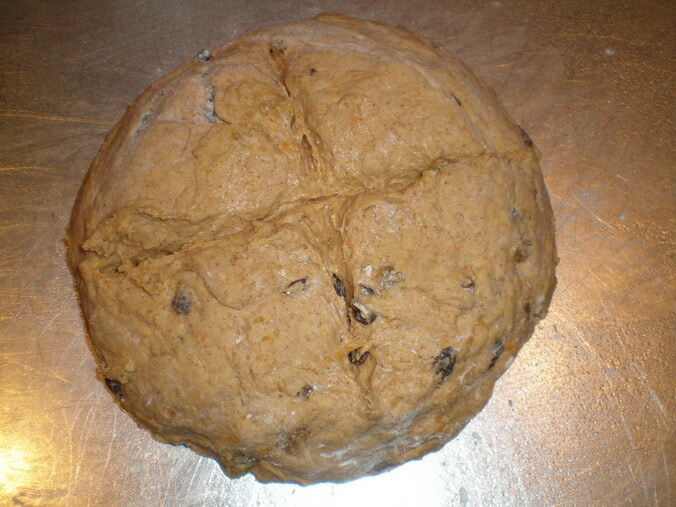 I never would have been interested in making Irish bread before reasing this.. nice. Thanks, I hope all the pictures help people when they make it, especially nice for beginning bakers. Let me know how it turns out for you!